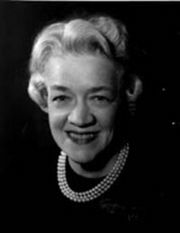 Margaret Chase Smith (December 14, 1897 – May 29, 1995) was a Republican Senator from Maine, and one of the most successful politicians in Maine history. She was the first woman to be elected to both the U.S. House and the Senate, and the first woman from Maine to serve in either. She was also the first woman to have her name placed in nomination for the U.S. Presidency at a major party's convention (1964 Republican Convention, won by Barry Goldwater). She was a moderate Republican and might be termed a Rockefeller Republican. She was the first (and as yet only) woman chair of the Senate Republican Conference, 1967–1972. Upon leaving office, Smith was the longest serving female senator in United States history. She rose to prominence in a male-dominated political system and in a chamber that in early twenty-first century has only 16 (out of 100) women members. From 1973 until 1978, following her defeat, there was not a single woman in the US Senate. In 1992, there were just two women Senators. She was especially outspoken in criticizing the tactics Joseph McCarthy in his efforts to stamp out communism, which she saw as a threat to people's right to freedom of belief and expression. Aware that her own presence in the Senate was the fruit of women's struggle for political rights, she argued strongly for women's participation not only in national government but also at the United Nations, pointing out that as wars are man-made, peace might at least in part be made by women. On the one hand, she consciously stood on the shoulders of those women whose struggle for gender equality had won the vote. On the other hand, her legacy is an outstanding example of public service to inspire men as well as women who enter the political arena. Her instincts tended to transcend party politics. She wanted to unify, not to divide. Margaret Chase was born in Skowhegan, Maine, on December 14, 1897, the daughter of Carrie Murray and George Emery Chase. As a young woman she taught school at a one-room schoolhouse, worked as a telephone operator, managed circulation for the Skowhegan Independent Reporter, and served as an executive with a local textile mill. She became involved with local women's organizations and helped found the Skowhegan Business and Professional Women's Club. She never received a college education. In 1930, she married Clyde Smith, a respected political leader in central Maine. She was elected to Congress in 1936 serving until his death in 1940 as a Republican representing Maine's Second District. Margaret was his secretary. She first won a seat to the U.S. House of Representatives on June 3, 1940, to fill the vacancy caused by the death of her husband. She served on the House Naval Affairs committee during World War II. Her efforts to encourage women to join the navy led to her "mother of the waves" tag. As co-chair of a subcommittee that investigated problems encountered by the War Department in rapidly establishing bases across the nation, she was instrumental in resolving conflicts between states, local jurisdictions and the military. She was a major player in passing of the Women's Armed Services Integration Act (1948) which secured equal pay and rank for women in the US military. She was elected to the U.S. Senate in 1948. She served in the Senate from 1949 to 1973. As her biographer suggests, the Senator at this time was "no place for a woman". The first women who ever sat in the Senate, Rebecca Latimer Felton did so for two days replacing her deceased husband by appointment of the Governor of Georgia. Considering that no women was elected to the Senate until Hattie Wyatt Caraway in 1931 (she served until 1945), even that was a significant appointment. From 1945 until 1947 there were once again no women in the Senate. In her bid for a third term in 1960, the Democratic Party put up Lucia Cormier, the Democratic floor leader of the Maine House of Representatives, making it the first time two women ran against each other for a Senate seat. By the end of her fourth term, the charm she had had for so many years seemed to evaporate. She was defeated for reelection in 1972 by Democrat Bill Hathaway, the only election she ever lost in the state of Maine. In her last election Smith had been plagued by rumors of poor health (she had been using a motor scooter around the Senate). A Republican primary challenger taunted her for being out of touch; she did not have a state office operating in Maine. Also, she alienated liberals with her support for the Vietnam War while turning off conservatives with her votes against Nixon Supreme Court nominees Clement Haynsworth and G. Harrold Carswell. and that she was a left-wing apologist. "My creed is that public service must be more than doing a job efficiently and honestly. It must be a complete dedication to the people and to the nation with full recognition that every human being is entitled to courtesy and consideration, that constructive criticism is not only to be expected but sought, that smears are not only to be expected but fought, that honor is to be earned but not bought.". She did not want to "want to see the Republican Party ride to political victory on the Four Horsemen of Calumny: Fear, Ignorance, Bigotry and Smear." Senator Smith had a professional and personal relationship with staff assistant William Lewis, a lawyer from Oklahoma with a Harvard MBA. He had been assigned to work with the House Naval Affairs committee while with the Naval Reserve. His political and legal savvy combined with his knowledge of military matters augmented her own experience. He remained her political adviser and personal partner until his death in 1982. She received the Presidential Medal of Freedom from President George H. W. Bush in 1989 in addition to the U.S. Air Force's top award, the American Spirit Award, in recognition of her contributions as a "great American patriot." She was also presented with a Doctor of Laws honorary degree from Rutgers University in addition to 93 other honorary degrees. If I am to be remembered in history, it will not be because of legislative accomplishments, but for an act I took as a legislator in the U.S. Senate when on June 1, 1950, I spoke...in condemnation of McCarthyism, when the junior Senator from Wisconsin had the Senate paralyzed with fear that he would purge any Senator who disagreed with him. Wars are man-made. Peace could be partially woman-made. But the blunt truth is that women have merely echoed the same fears of men who make war. I just have a notion—maybe it's a woman's hunch—that were there a half dozen outstanding American women—women versed in world affairs - to sit down with a similar group of women from France, England – and yes, even Russia—to discuss means of attaining world peace - that they could get somewhere. They might avoid the seemingly dangerous impasse that men have created to the moment... The men have been given their chance - why not let the women have theirs? Her legacy is preserved by the Northwood University Margaret Chase Smith Library at Skowhegan, founded in 1982. In 1973, she entered the National Women's Hall of Fame in Seneca Falls, New York as one of the first twenty women to be inducted. In retirement, in addition to the work of her own Library, she toured the US as Visiting Professor for the Woodrow Wilson National Fellowship Foundation. The center for public policy at the University of Maine is named in her honor. She requested that her own epitaph would be "she served people." She has widely been referred to as a "woman of courage." Janis Benson portrayed Senator Smith in the 1998 miniseries From the Earth to the Moon. Patricia Neal dramatized Senator Smith's Declaration of Conscience speech in the 1978 television movie Tail Gunner Joe. ↑ 1.0 1.1 Margaret Chase Smith (1949), Women's World Group Margaret Chase Smith Library. Retrieved June 14, 2008. 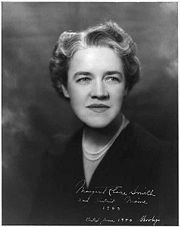 ↑ Margaret Chase Smith (1956), Letter to Honorable Joseph R McCarthey Margaret Chase Smith Library. Retrieved June 14, 2008. ↑ Margaret Chase Smith My Creed Margaret Chase Smith Library. Retrieved June 14, 2008. ↑ 5.0 5.1 Margaret Chase Smith (1950), "Declaration of Conscience," Margaret Chase Smith Library Declaration of Conscience Retrieved June 14, 2008. ↑ Honorary Degrees Margaret Chase Smith Library. Retrieved June 14, 2008. ↑ Margaret Chase Smith, Expanded Biography Margaret Chase Smith Library. Retrieved June 14, 2008. History of "Margaret Chase Smith"
This page was last modified on 14 August 2018, at 15:34.